We really enjoyed reviewing Stretch Armstrong, he's still going strong and Jacob has stretched him alot! So we were super excited to be sent Stretch Armstrong Vac Man to review. Vac Man is back, with new stronger formula which is ideal for 21st-century fun, and he can be stretched to 4 times his original size. 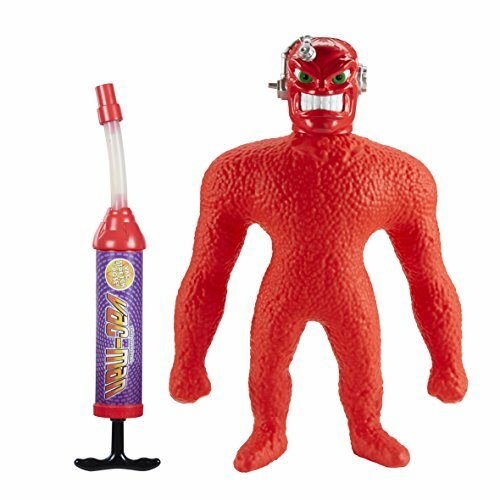 Vac Man is a 14″ fully stretchable and poseable Vac powered action figure. He's quite heavy and robust. With the included pump, you pump the air out of him and then you can set him into any pose. Release the valve and he returns to his normal state. The vacuum pump connects to the side of Vac Mans' head. You have to pump him around 6 times to get the air out and then you are good to go. You can tie him in knots and bend him in all sorts of positions. Jacob's had lots of fun and laughter trying to see how far they can stretch him. Vac Man is pretty unbreakable - the kids have certainly tried! RRP £29.99, this would make a great present. It offers hours of fun.